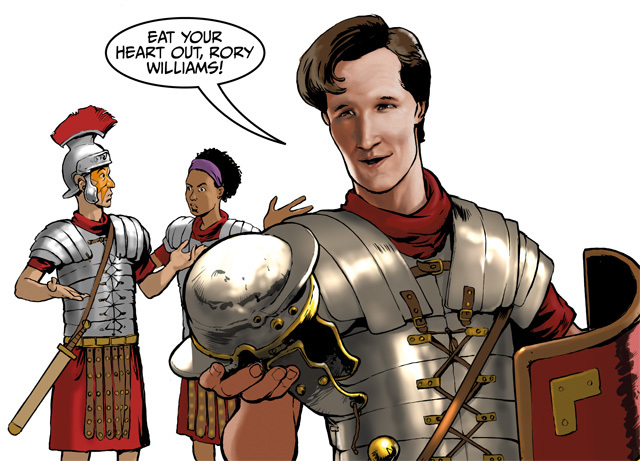 The God Squad Cometh: Doctor Who - THE ELEVENTH DOCTOR #13 Review | Warped Factor - Words in the Key of Geek. Tony Fyler wants to ask if you’ve considered letting Matt Smith into your life. Some all-powerful creative intervener in the randomness and chaos? Something that hears the pleas of the weak, overturns the might of evil, and always stands up for the little people against the random brutality of existence? Yes, I know, not exactly subtle, is it, this ‘The Doctor Is God’ nonsense? Believe it or not though, it’s a question of exceptional relevance to Conversion Part 2. It couldn’t really be anything but relevant when the situation we find ourselves in is standing on the battlefield with the newly-converted first Christian emperor of Rome, Constantine the Great, and he’s just seen a sign in the heavens. Sadly for Constantine, it’s not a sign from his newly-chosen god, it’s the Cybermen, for whom conversion has (let’s be generous among geeks) a whole other meaning. As it happens, it’s even worse than that, and even more apposite to the question of belief in a deity somehow connected to your image, your life and your actions, because despite the end of the uber-arc that was the ServeYouInc storyline, the ‘entity’ at the heart of that corporation, which is able to give people whatever they want, is still alive – and now it’s bonded with the Cybermen. An army that shows you what you most want to see in order to convert you – I swear, the symbolism’s not mine, it’s all on the page. 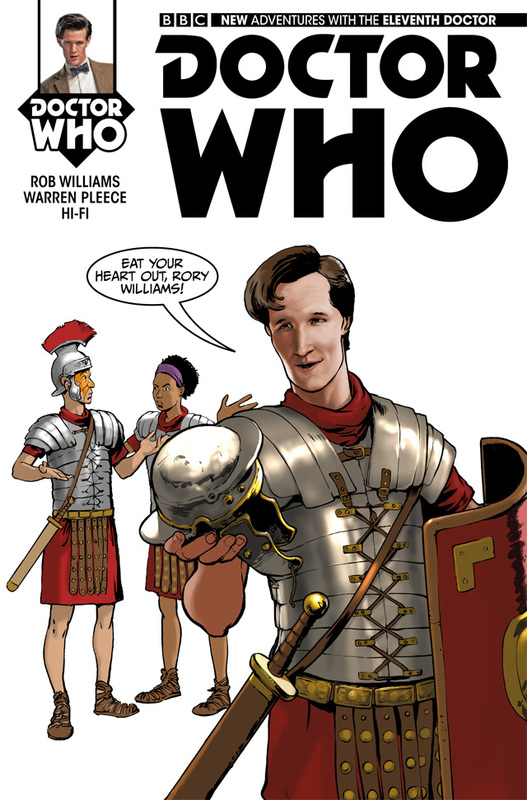 And just when you thought the metaphor from writer Rob Williams couldn’t get any more clear and straightforward, it suddenly does – ARC, the Doctor’s shape-changing companion, is actually the missing brain or mind of the entity, meaning what’s approaching the Emperor Constantine is a brainless or mindless army of followers, prepared to show you your heart’s desire so they can convert you into one of them. Comic-books are great, aren’t they? 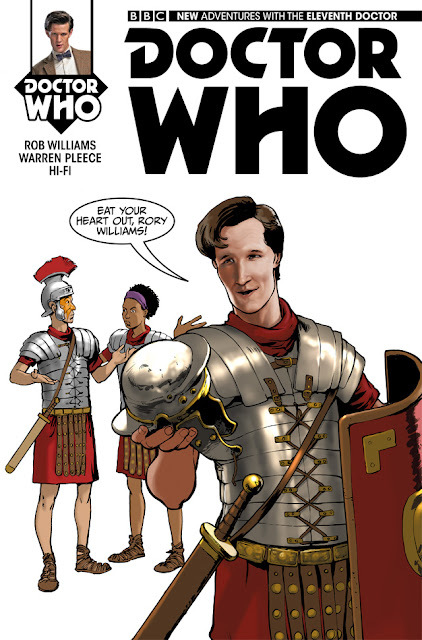 If it all sounds a bit crass and bashing-over-the-head, apologies – that’s me, not Williams’ story, which actually takes some pains to show sides and depth to the whole question, as well as flashing up a tantalising image of what the Doctor most wants to see. He finds a way, with ARC’s help, into the emotional core of the entity and finds what you might expect to find – a frightened, almost broken thing, that wants numbers around it to protect it from the pain of the universe. But this is not a battle that can be won without consequences for the Doctor – or his friends. And even the solution he devises will have horrifying, bloody consequences – a fact which Alice, his librarian friend, is not shy to point out to him. There’s a good, televisual balance here between the funny stuff, at which Matt Smith’s Doctor always excelled, and the deep sadness and rage at which, to give the young actor his due, h excelled even further. Artist Warren Pleece delivers both very well, and in more than a few cases, it feels like he’s captured the precise facial mannerisms of the actor in the comic-book form – an extra special gift in a story as surprisingly harrowing and deep as this one. The question we’re left with at the end of this issue is whether the Doctor actually did enough good, saved enough people and worlds from the impact of Cybermen who show you what you want to see. There will clearly be consequences – in fact the consequences are almost self-evident from the last few panels of this story. Despite having little in the way of choice about his actions, whether the Doctor will escape Scot free is actually in doubt as this issue closes, leaving what began in issue #12 as a great, quite funny, high-octane idea with added Cybermen feeling dark and quiet and sombre by the end. In tone at least, Conversion Part 2 pulls an Earthshock out of the bag, and you need to read it before anything that follows will make a great deal of sense, because the dilemmas it leaves us with, the situation in which it leaves the Doctor, ARC, Alice and Jones is a million tonal miles from where it begins, or where issue #12 ended. You need to read Conversion, Part 2 – not necessarily for the religious metaphor, but for the character arcs it delivers, the resolutions it brings, and all the difficult new questions with which it leaves you going forward.